BALTIMORE, MD (October 20, 2016) – Seven different statewide cyber communities today announced the creation of CyberUSA, a new national platform for collaboration in economic development and innovation, and plans to expand the effort to include 30 states within the first year. The announcement was made at the CyberMaryland 2016 Conference. 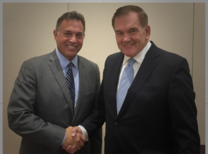 CyberUSA, will be chaired by Governor Tom Ridge, the nation’s first Secretary of Homeland Security and Chairman of Ridge Global. The group will coordinate public and private efforts across different states and communities to ensure American leadership in cybersecurity by shaping the education, innovation and policy landscapes at both the state and federal levels. [trcyberusa] CyberUSA also will develop a national threat-sharing platform to enable different cyber communities to begin threat-sharing programs. The collected data can then be shared with other regions, and will be accumulated at the national level for working with federal leaders. CyberUSA will initially include CyberMaryland as well as existing cyber communities in California, Texas, Massachusetts, South Carolina, Louisiana and Colorado. Former US Commerce Undersecretary Phil Bond will serve as executive director of the group, while former Symantec government relations executive Adam Rak will serve as national policy director. Bond explained that the new group’s mission will have three facets: programs and policies to spur innovation, education and economic development centered on cyber security; threat-sharing to increase security at the local and national levels; and bundled affinity programs, starting with cyber insurance. “A national association of associations can help expedite best practices, share threat intelligence, and leverage buying power to help companies better manage cyber risk,” Bond added. The seven core states (Maryland, California, Texas, Massachusetts, South Carolina, Louisiana and Colorado) will comprise the CyberUSA board. The inaugural board also will include the University of Maryland, and will be open to leaders from industry, academia and government. Federal programs such as the National Security Agency-sponsored NSA Day of Cyber and the National Initiative on Cyber Education led by the National Institute of Standards and Technology (NIST) are natural partners with the private sector, Bond said. The project will be housed under a 501(c)(3) organization, the Foundation for American Science and Technology, that was founded in 2014 by Bond, former Obama Cyber Adviser Howard Schmidt, and former Symantec executive Adam Rak. CyberUSA grew out of an initiative by CyberMaryland to work with states and communities across the country to build and connect cyber ecosystems. CyberMaryland Co-Chair David Powell launched that initiative with Larry Letow, Rick Geritz and Mike O'Neill and will be an active part of the CyberUSA leadership, serving as Vice Chair. CyberMaryland is widely recognized as being the first mover to form a state-based cyber community, built on the state’s mix of public and private cyber security leaders. Today, it is the largest such community and host of the largest industry annual gathering.